Import Export all types of products like simple, configurable, grouped, bundle, downloadable and virtual. Import/Export products with categories ids or categories name. If categories do not exist then it will create new categories automatically then assign products into that categories. Support multiple products images import/export as well as you can update products images as per your requirements. Import/Export products with all types like dropdown, checkbox, radio button etc custom options. Import/Export Custom and Magento's default attributes data in separate columns like Magento 1. Import/Export all the Magento's default system as well as custom attribute data. Import/Export Related, Cross Sell and Up sell Products with their positions. As well as Import/Export Tier Price for products. Support Multi Website, Multi Store and Multi Store View for Import Products. Give options for All Fields Export, Export Only Image Related Fields, Export Only Price Related Fields and Export Only Inventory Related Fields. Give you different types of require filters like export the products using an attribute set, product type, product status, product visibility. Export the products categories wise. Magento 2 Import Products extension is easy to use and come with user-friendly layouts. Using this extension, you can import and export all types of products in your Magento store using CSV file. You can use import/update products for the stock update, price update, images update, products description update etc. You can import/update products for some specific fields, so it is fully customize CSV file with some specific fields are mandatory. You can export products CSV file as per your requirements from your older version Magento store and import into your newer version Magento store. We have created complete documents with snapshots for extension installation and how to use our extension. We also provided different types of sample CSV files for Import Products as per your requirements. You have to check the sample CSV files and create same format CSV file for importing the products. You can upload your created or exported .CSV (Comma Separated) file from here. Our extension allow .CSV (Comma Seperated) file format so you can manage it easily. Choose uploaded or already exists CSV file from here. You can choose Import Behavior as per your requirement. Whether you want to import/update the products or delete the products in your site. You can also choose Validation Behavior. Whether you want to validate your CSV file or skip it. If any issue found in your CSV file then all the errors will be displayed here. We bifurcate errors into two sections. Major and Minor. If you did not fix minor error then it will allow you to import the products but in major error, you have to fix the issue in your CSV file. Here you can see all the errors which occur during import the products for each of the products with SKU and error details. Store View: You can export products store wise. Select Fields For: We provide some preset template for export the products like image related, inventory related, price related, cross-sell, up-sell and related products related fields. Attribute Set Name: You can export the products from a specific attribute set products as well. Type: You can select which product type products you want to export like simple, configurable, bundle, grouped etc. Status: You can select which status products you want to export. Like Enabled or Disabled. Visibility: You can select which visibility products you want to export. We manage export products CSV file history so you can easily download exported CSV later on as per your requirement. We provide categories filter. Using categories filter you can export the products categories wise. Does exactly what it claims to do, very well. The tool does exactly what it says it does very well. We purchased the M2 version, it was easy to install and easy to use, we are very pleased that we invested in the product. this extension is very useful and makes product uploads hassle free. I love it. Magebees is exceptionally proficient. I obtained the extension, Import Export Products Extension For Magento 2, from them two months back. The extensions works useful for my new site on account of their quick specialized support. This is a great extension. We experienced lots of issues with the Magento 2 native import trying to import configurable products with hundreds of children. This extension has worked really great and the support provided to us has been outstanding. Thank you guys!! We are using Magento 1 Import Export Products Extension from long time. Now we upgrade our store to Magento 2 and we bought MageBees Magento 2 extension. Super extension and great with features. It works for all type of products. Once again happy to use this extension and MageBees Service. Best extension in the marketatch editing (add/remove/edit) your item inventory, descriptions, categories, attributes so much easier. We tried other Magento 2 Import Products Extension but this is the best compare to all others because it provide all the types of products. Easy to use and also get quick support from MageBees Team. The most useful Magento Plug-in. It makes batch editing (add/remove/edit) your item inventory, descriptions, categories, attributes so much easier. Simply edit the csv file then import to Magento. It saves me so much time! Easy to install, easy to use, plus excellent Support! Give configurations for Multiselect attribute separator. Optimized and Modified the code for support Magento's latest versions 2.1.16, 2.2.7 and 2.3.0. Add new filter for export the products by product id range. Fixed Product Images issue in Multi Website and Stores. Add Magento translate code in phtml files. Handle the exception for CSV file not in a proper format. Fixed the updated product issue in Multi Stores. Fixed the Custom text attributes are not included while export the products. Fixed the Upsell, Cross Sell and Related Products are not display proper count in admin issue. Fixed the issue regarding some attribute values are not imported. Fixed Tier Price Export issue. Fixed the issue regarding removed downloadable options when we try to import downloadable product options and custom options together. Fixed custom option deleted issue while updating the products images. Fixed sometime Import Product button not a display issue. Fixed dowloadable product samples are not imported issue. Fixed the type column not exported issue while create the CSV using Download Images From Live URL section. Updated and Improved User Manual document. Fixed tier price update issue. Fixed upload button does not display issue after error log. Fixed product disabled issue while assign up-sell, cross-sell products in multisite. Fixed Image import/update related issues. Fixed Undefined index error while importing the bundle products. Fixed 404 page not found an issue in Export and Import Grid. Fixed undefined offset error while update downloadable products. Did Some require modification in the documentation. Fixed Custom Options related issues. Fixed Custom option issue for Magento version 2.2.x. Fixed downloadable products import issue. Add categories filter for export the products categories wise in export page. Fixed the category import issue in multi website. Fixed the URL key error while import same name category. Fixed product image removed issue while update other data and when no image related column define in csv file. Fixed the custom option import issue in configurable, virtual and bundle product type. Fixed generated csv file issue in download images from live URL section. Now you can download images from live URL and use it for import the products. Q-1: How to Export Products from Magento 1 and Import them in Magento 2? Ans: In that case you have to follow below step. Installed our Import Export Products Extension for Magento 1 (https://www.magebees.com/magento-import-export-simple-products-configurable-products-bundle-products-group-products-downloadable-products.html) in your Magento 1 site. 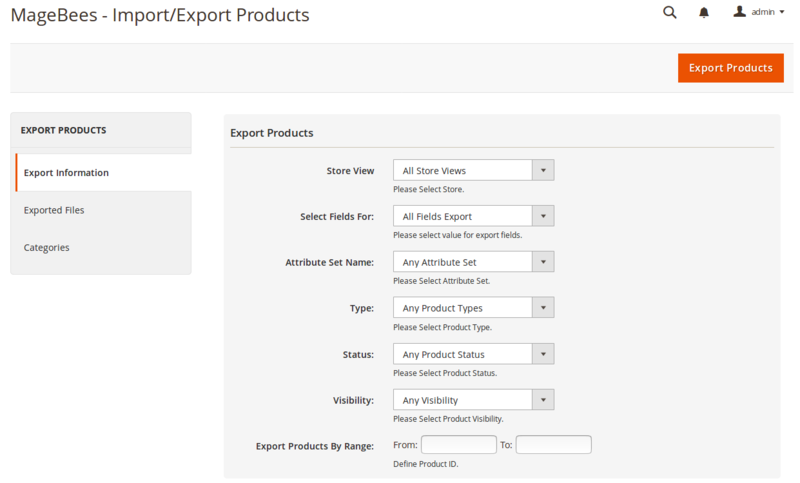 Export the products in your magento 1 site From MageBees -> Import/Export Products -> Export Products. Now time to copy images. For that copy media/catalog/product folder and put it in pub/media folder and rename it as "import" in your Magento 2 site. Now Login in your Magento 2 site and go to MageBees -> Import/Export Products -> Import Products. Go to Run Profile Tab and select your csv file from "Choose Import File" and click on Validate & Import File Data button. After Validate your csv file you need to click on "Import Products" Button. Q-2: I have installed Import Export Products extension but got following error. "There has been an error processing your request". "Please upgrade your database: Run bin/magento setup:upgrade". Ans: Run "php bin/magento setup:upgrade" command to your terminal or command prompt. Please see installation steps for that. Q-3: I have installed import export Products extension but when i open admin and i got "Specified invalid parent id (Magebees_Menu: title)" error. Ans : Please enable "Magebees_Menu" module by run "php bin/magento module:enable Magebees_Menu" from command prompt in magento root directory. Q-4: I am getting max execution time error, what I have to do? Ans: If you getting time out then increase your server max execution time. For that you have to contact your server/hosting support team. Q-5: Products import working fine but QTY showing blank. How i can solve? Ans : This is caused by improper CSV format. Please use openoffice.org calc spreadsheet application and saving in UTF-8 format. Please use Google Spreadsheet for Convert Your CSV in UTF-8 format. Q-6: What I do when products import going correctly with no single errors but they don't show on frontend until I re-edit and save it? Ans: It’s because you are missing the "options_container" column in your csv and its values. These are required and it’s recommended not to change or remove columns or remove it. Q-7: How to create or manage parent and child category? Ans: Here some string mention for category column. Explained bellow. Parent Category: if you use this string then it will create Parent Category. Parent Category/Child Category: if you use this string then it will create Parent Category first, then it will create Child Category. Parent Category/Child Category/Sub Child Category: If you use this string then it will create Parent Category first, then it will create Child Category and then create Sub Child Category. Q-8: Import Screen Showing "Fatal error: Call to a member function getId() on a non-object" ? Ans: This error comes because of you not created attribute which you mentioned in CSV. OR attribute is not assigned to attribute set. Q-9: I am getting "var/export directory does not exist !" error? Ans: This error comes due to var/export directory does not exists or not having write permission. Q-10: I am getting "var/import directory does not exist !" error? Ans: This error comes due to var/import directory does not exists or not having write permission. Q-11: I am not able to update attribute set. Ans: You can’t update attribute set values using our extension. Q-12: I am getting "Product SKU filed in sku is empty" error while try to import the products. Ans: This error occur because of your csv file is not created in UTF-8 format. You must convert your csv file in UTF-8 format using open office or Google spreadsheet. Q-13: I am not able to import/update products images. Ans: For Import and update the products images you must define four column image, small_image, thumbnail and gallery in your csv file. Q-14: I am getting below error while trying to import the products. A technical problem with the server created an error. Try again to continue what you were doing. If the problem persists, try again later. Ans: When this error occurred that means there is something wrong in your CSV file or in the site Data. This is Magento's default error handling message so you have to contact our support guy when you get this kind of error. Our support team will check our issue and give you a proper solution. Q-15: I am not able to Import Configurable Products Properly. Ans: In this case you have to check below things. 1. All the defined attributes have proper value or not and define in the sample products. 2. All the attributes are added in the mentioned attribute set. 3. The attributes which you want to use to create the configurable products are defined in the “used_attribute” column. 4. Make sure you have mentioned correct SKUs in the "child_products_sku" column also make sure that all the products are already available on the site. Note: The best practice for import the configurable product is making the separate CSV files. One for its associated (simple) products and another is for configurable products. First import all the simple (it’s associated) products then import the configurable products.